Our rooms are decorated to a high standard and have hospitality trays, hairdryers and TVs available. Knox Bed and Breakfast is close to all amenities in Prestwick, including the Beach, Bowling Green and Golf Course. We are within walking distance of Prestwick town centre, where you will find a good choice of pubs and restaurants offering evening meals. 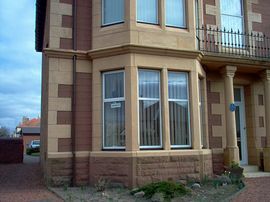 We are situated only one mile from Prestwick Airport. We have a car park for guest use only. From Prestwick Town station: Travel east towards town centre (400 metres) then turn right and continue through Prestwick town. Approx 3/4 mile. From Prestwick Airport: Follow main road through Prestwick Town towards Ayr. About 1 mile from the Airport there is a JET Petrol station on your left hand side. We are 300 metres beyond the petrol station (House is on the corner of the next junction to the left).